The heat is sweltering, the football magazines are on the shelves, and millions of fans, and thousands of players and coaches are wondering if this will be our year. Soon the coaches will say goodbye to their families for 4 months as they work long hours molding boys into young men in hopes of winning their last game of the post season. It is that time of year again Jacket fans. The Texas high school football season is upon us all. The ups, the downs, and everything in between. It is going to be another fun and exciting year of football. The Jackets came into 2010 with high expectations with a plethora of returning talent and top 5 pre-season rankings. Stephenville stumbled out of the blocks to their worst start since 1984 going 1-4 in their first 5 games. The players and coaches kept their noses to the grind stone and believed in each other. Before it was all said and done the Jackets were in qtr. finals for the 2nd time in 3 years, and Coach Gillespie accumulated the 2nd most playoff wins by a Stephenville coach behind only Art Briles. I have a feeling that the Jacket program will accomplish even greater feats under the careful watch of Coach Gillespie and Co., and it could happen in 2011. Stephenville has nearly every skill position returning in 2011 starting with Baylor commit Aiavion Edwards. Edwards was nothing short of spectacular last year accumulating 1,744 yards and 22 touchdowns rushing, 289 yards and 1 touchdown receiving, 31.5 yards per kickoff return with 2 touchdowns, and 1 interception return for a touchdown. The amazing thing is Edwards did all his damage offensively in just 11 games. He became the starting running back in the 4th game against Hebron after James Myles left the team for personal reasons. Edwards is primed for a special year, Lord willing. The Jackets also return their top 5 receivers from last year led by Witt Westbrook and Gabe Barrios. The pair combined for 111 receptions and 1,485 yards. Westbrook may see more time on defense this year. There is one underclassman that had a good spring that Jacket fans will want to keep an eye on and that is junior Brice Gunter. Gunter is a tall rangy young man that can really go up and get the ball. Some other receivers that stood out in spring ball were tight end Trent Morrison and slot receiver Alex Sanchez. Although Conner Washington is a two year starter he is being pushed by junior to be Tyler Jones for the starting job. Both are mentioned in Dave Campbell's as top QBs in their respective classes, and they split reps in spring ball and 7 on 7. Washington is climbing the ranks in many statistical categories in the Jacket record books, but the young athletic Jones is making a bid to start his own legacy at the most scrutinized position in Stephenville Yellow Jacket football. This battle may continue into August and pre-district. One place of uncertainty for the Jackets is the offensive line. Stephenville must replace all 5 starters from a year ago including 4 multi year starters. One thing this new bunch will not lack in and that is size. There will be no easing into it for the new members of "The Wall". They will need to have the kinks worked out early against some very good competition. Once the QB situation works itself out and the new OL comes together I believe this offense will be even better than the 2010 version. The 2011 "Wardogs" have the makings of a great defense. But as we all know greatness is not made on paper but on the field. It all starts up front with potential all state defensive lineman Russell Cole. Cole plays in my opinion the most important position in the 3-4 defense and that is nose guard. Cole had an amazing 37 tackles for loss and 4.5 sacks last year. He has been so good he takes up 2 to 3 offensive linemen which frees up the backers to make plays. The leading playmaker at linebacker is TSWA 1st team all-state Padyn Giebler. Giebler had 113 tackles including 20 for losses with 2 forced fumbles and 1 fumble recovery. Giebler will be a 3 year starter. The Jackets will boast 1 other 3 year starter at the linebacker position with Holton Westbrook moving from his safety spot to linebacker. Westbrook was the 4th leading tackler last year with 82 tackles, 4 forced fumbles, 1 fumble recovery, 3 INTs, and 1 touchdown. The Jackets would have had three 3 year starters at LB but Tyler Floyd is out with an injury. Leading the way in the secondary will be returning starter Braden Coverdale. Preston Brown is slotted to start at conerback. Brown started last year after Reilly Avalos went down mid-season with an injury. Charles Cain who was slated to start at the other CB spot was injured in 7 on 7 action and is not expected to be back this year. Stephenville should be very strong in this phase of the game as well. Blake Barnes returns as the place kicker. Barnes was 13 of 22 on field goals with a long of 47 yards. He was nearly perfect on PATs 50 of 51. Holton Westbrook returns as the punter. The Jackets should be very good in the return game. Edwards averaged 31.5 yards per kickoff return with 2 TDs. They will have several good candidates to choose from to perform the punt return duties. The Jackets will need to improve in one very important category if they want to overtake the two time defending champ Aledo Bearcats, and that is turnovers. Stephenville lost every game last year that they lost the turnover battle and won every game they either won the turnover battle or broke even. The Jackets are plenty good enough to win their 5th state championship this year but they will have to go through their rival Aledo to do it. The Bearcats are loaded for another run at 3 straight. My prediction for the Jackets is 11-3 with another qtr. final loss to the Bearcats. Game 1: Aledo- Win- The Bearcats have won 5 straight with all but one of the games coming down to a handful of plays. The Jackets break the streak at home. Game 2: @ Abilene Wylie- Win- After watching the Bulldogs's subvarsity I believe they are still one year away from returning to their usual dominant ways. This is a trap game for the Jackets as they are on the road in between games with their two biggest rivals. Game 3: Brownwood- Win- The Lions had their best team in my adult life last year. They lose a ton of talent that will be hard pressed to replace. I sense a big victory for the Jackets in The Battle of 377. Game 4: @ Lewisville Hebron- Win- The Hebron loss was a tough one last year as Stephenville appeared to be the better team but too many mistakes resulted in a 3 point loss. The Hawks graduated their team leader and multi year starter QB Kyle Aubuchon. They do return some other highly touted skill players and the 'Woodshed' is a tough place to play but I believe the Jackets will reverse the outcome and come out with a 3 point victory. Game 5: @ Mesquite Horn- Loss- The Jags who are loaded with D-1 talent will hand the Jackets their first loss of the season. Game 6: San Angelo Lakeview- Win- The Chiefs will more than likely bring up the caboose of 8-4A. Game 7: @ Waco University- Win- The Trojans return 7 offensive and 8 defensive starters from a year ago, but I don't think they will be good enough up front to beat the Jackets. Game 8: Killeen- Win- The Roos lost two D-1 players including QB Michael Cummings. They do return several other starters and should be a playoff team. Game 9: Hewitt Midway- Loss- The Panthers lost a lot to graduation but have some big time talent coming back and up. Shakiel Randolph is a D-1 talent on defense and he will be joined by several junior stars in the making on offense with Jordan Darling at QB, Hunter Jarmon at WR, and BJ Kelly at RB. Game 10: @ Waco High- Win- The Lions return 8 and 8 starters and could challenge for the district championship. They beat Everman in the first round and gave Aledo all they wanted scoring 35 and rushing for over 400 yards. Bi-District: Crowley- Win- The Eagles returned to the playoffs last year in Coach James' first year. He has 5 and 4 starters coming back. Area: FW Southwest- Win- The Raiders advanced to the 2nd round last year for the first time in school history. They have 7 offensive and 8 defensive starters returning from a team that played Stephenville hard in the playoffs last year. This could be the best team to come out of FWISD in several years. This will not be your typical Fort Worth team. Regional: Lake Dallas- Win- The Falcons were a playoff team from a year ago and return 8 on offense with QB Dalyn Williams leading the way. Qtr. Finals- Aledo- Loss- The Bearcats will have their best team since the Jackets started playing them in 2002. If Bishop and Gray are healthy I don't see anyone stopping them from the 3-peat. Be Loud! Be Proud! and Be Ready! How to read the picks, the team listed first is the favored team and the number to the left of that team is the point spread. After a long winter and even longer summer it is that time of year again. Opening weekend of high school football in Texas has become like a major holiday. People schedule time off with all the kickoff classics going on and parties abound. I can't wait to hear the band playing, see the drill teams lining up, and feel the butterflies in my stomach before kickoff. It is time Jacket fans, it is time! The Jackets start the 2011 football season like they have the last 3, against their rival Aledo Bearcats. Stephenville has dropped the last 3 season openers and last 5 overall against the Bearcats. All five losses with the exception of last years season opener have been by 8 points or less. Both teams come into this year with high expectations and pre-season rankings. Aledo is the number 1 ranked two-time defending state champs with a bevy of returning talent. That will aid them in their bid at 3 straight championships. Both of these teams know each other very well and there will not be many surprises between the two. I expect a few early season mistakes and another hard fought classic between these two fine programs. Here are your projected starting lineups. There is not much I can say that most Jacket fans don't already know about the Bearcat offense. Aledo has Johnathan Gray, arguably the best running back in the nation according to most recruiting services. Let me repeat that the best in the nation. Then you can throw in an all-state QB in Matthew Bishop, all-state D-1 left tackle Michael Wilson, and finally their returning leading receiver Michael Mann. Here is my Captain Obvious statement, the Bearcats are loaded on offense. Aledo will feed Gray the ball which will open up their very deadly and underrated passing attack. The Jackets have done a good job of limiting Gray in their 3 games against him. Stephenville will need to contain Bishops scrambling ability and force turnovers. Something they have not been able to do the last several meetings. Although this will be the fourth game for Bishop and Gray against the Jackets it will be their first in Stephenville. This is the side of the ball where I think you will see the most change from the Bearcats. Last year Aledo had arguably their best secondary in several years. That allowed the Bearcats to man up on the outside and bring pressure. I think you will see much less blitzing and more zone from Aledo. But as always they will be very well coached and ready to go. The top play makers on defense for Aledo are at linebacker, Gunner Johnson and Dayne Davis. The Jackets have the athletes at receiver to test the new secondary of Aledo, but the inexperienced offensive line of the Jackets remains a big question mark against the very good front 7 of the Bearcats. The kicking game was an adventure for the Bearcats last year. Early reports are that their kicking game will be much more stable as they connected on two FGs in their scrimmage. I think it goes without saying, don't kick the ball to Gray..
Stephenville matches up very well against Aledo and these two teams bring out the best in each other. I expect nothing to change in that regard. The key stat in this match up is Aledo has won the turnover battle in every game during the 5 game winning streak. Until the Jackets can change that stat the streak will continue. The Bearcats are the back to back state champs with several of their stars returning. I think until the Jackets can prove it on the field you have to respect what Aledo has done the last two years and 5 games against Stephenville. I know in my pre-season article I picked Stephenville to win this one. But that was before it was known that one of the Jackets' top defensive players from last year would not be returning and they would have two starters on the offensive line sitting out with minor injuries. My heart says Jackets but my head says Aledo. Now for the rest of the 8-4A picks. #5 Hewitt Midway Panthers (0-0) vs. Round Rock Dragons (0-0): Round Rock went 2-8 last year in district 16-5A. Midway won this match up 17-0 in 2010. The Dragons have 7 offensive and 3 defensive starters returning. Midway should not have a problem in this one. Waco Lions (0-0) vs. Austin High Maroons (0-0): Austin High was a 4-7 playoff team last year in 5A. The Maroons return 6/4 starters. Waco won a barn burner in 2010, 34-32. The Lions have 8 offensive and 8 defensive starters returning off a team I think has the potential to be a contender in region 1. Killeen Kangaroos (0-0) vs. Killeen Ellison Eagles (0-0): Ellison finished 6-4 last year in district 12-5A and have 6/6 starters returning. The Roos won the game last year 28-25 but I think graduation from some D-1 players will be to much to overcome in this cross town match up. Waco University Trojans (0-0) vs. Forney Jackrabbits (0-0): Forney finished 3-7 last year in 15-4A and beat University 29-0. The Jackrabbits have 6 offensive and 2 defensive starters returning. University has 7/8 starters returning off a 3-7 campaign in 2010. This should be a hard fought ball game. San Angelo Lakeview Chiefs (0-0) vs. Andrews Mustangs (0-0): Andrews was an 8-4 playoff team from district 2-3A in 2010. They beat Lakeview 22-7 in the season opener last year. The Chiefs return 6/6 starters off an 1-9 team and have a new coach this year. Andrews graduated heavy and only return 1 on each side of the ball. Be Loud! and Be Proud! There are times in every high school football fans life when you realize you just witnessed greatness. Whether it be from an individual player, team, or the game as a whole. It is those times that keep me coming back to the stadium every year. That was one of the top 3 regular season games I have ever witnessed. I wanted to go shake the hands of every player and coach from both teams for the privilege of watching them on the field. I said in Cody's Corner that these two teams bring out the best in each other and that was never more true than last night. What started out as the #1 4A team in the state flexing is muscle soon turned into a heavy weight fight with each team going punch for punch. Aledo appeared to take a commanding 20-3 lead early in the 2nd qtr. when junior QB Tyler Jones took over for the injured Connor Washington. Jones led the Jackets down the field for Stephenville's next 7 scoring drives. The Jackets closed the gap to 20-17 in the 2nd qtr. before Johnathan Gray extended the lead back out to 34-17. Jones closed the gap to 10 once more with a 31 yard scamper around right end. Aledo answered right back with one of Willie Gibson's 2 TD receptions. This one for 69 yards. Jones led the Jackets right back down the field and had 3rd and goal from the 17. That is when Jones threw one of his best passes of the night, a beautiful 17 yard strike to Hunter Bernays on a flag route. The Jackets would finally get a stop on the Bearcats. Two plays later, the other division 1 running back in this game Aiavion Edwards, took the hand off, darted right, and raced down Aledo's sideline for a 65 yard touchdown run. That cut the lead back down to 3 again 41-38 Aledo. Then on the ensuing kickoff ole mo' took a big turn to the side of the blue and gold as Aledo muffed the catch on the return and junior Alex Sanchez dove and recovered the football for the Jackets. On the very next play Jones found junior receiver Brice Gunter for the 2nd of his 2 touchdown receptions on a 15 yard strike. The Jackets took the lead 45-41 for the first time and would never surrender it. Sophomore safety Mookie Carlile came up with a big interception on Aledo's next drive that set up a Blake Barnes 35 yard field goal to push Stephenville's lead to 7 at 48-41. The champs still were not done as they marched right down the field and Matthew Bishop threw a beautiful 35 yard scoring strike to Gibson. Coach Buchanan decided to go for the lead on the road with 1:26 left and went for 2. Bishop handed the ball off to Gray who was stopped 1 yard short of the 2 point conversion by a host of Jackets. Stephenville would recover the onside kick and only needed one first down to run out the clock. Penalties and a near turnover resulted in a punt attempt by Stephenville. Aledo called it's last timeout with just 9 seconds left. The Bearcats blocked the Holton Westbrook punt attempt and recovered the ball at the Stephenville 25. Aledo lined up for a 41 yard FG try with 5 seconds remaining. 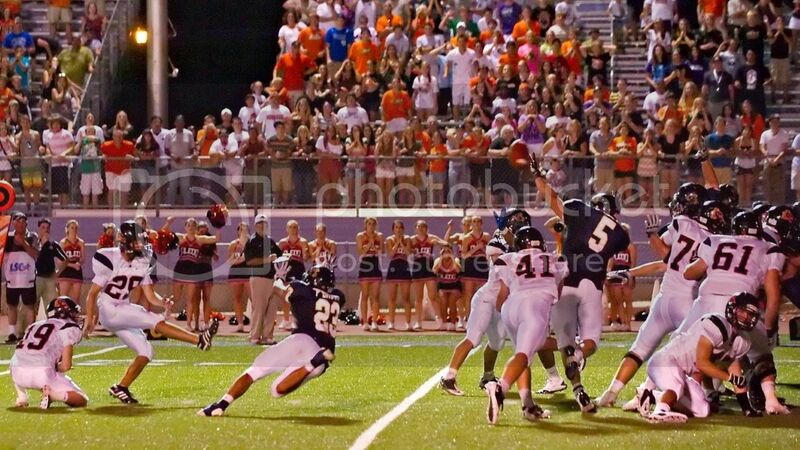 Stephenville junior cornerback Preston Brown blocked the kick with no time left on the clock. Jubilation breaks out on the Jacket sidelines but the ref is waving his arms as a lone yellow flag lays out on the field. The call is roughing the kicker. The refs mark off 15 yards and Aledo receives another try, this time from 18 yards out with :00 on the clock. Senior linebacker Padyn Giebler storms through the line and gets a paw up to block the 2nd attempt. This time there are no flags and the Jacket faithful erupt in joy. Text after text and email after email, they all had the same message, WOW! Those 3 little letters best described what we were all privileged enough to witness from Aledo and Stephenville. That was the best regular season non-district game I have ever seen. What a way to start the football season, on to the next.. This week the Jackets have the Wylie Bulldogs in their cross hairs. Wylie is coming off a 5-7 playoff season in D1 3A. They return 3 offensive and 3 defensive starters. The Bulldogs won last week over Rockdale 35-14. Wylie is a perennial big school 3A power house. They have made the playoffs 18 years in a row. I know many Jacket fans are giddy over last weeks performance, but it was only one game and now Stephenville must prove they can play like that on a consistent basis. Wylie will be no push over and Jacket fans should expect a dog fight. Pun intended..
Wylie runs a multiple offense. They are just as comfortable running out of shotgun as they are under center. Senior QB McLeod had a strong season opener throwing for 317 yards and 3 touchdowns. He completed 77% of his passes. McLeod spread the wealth, Manawes had 7 receptions for 131 yards and 6'5 Bloomer has 7 receptions for 107 yards. The offensive line has good size and did a good job against Rockdale. The previously mentioned receivers were very impressive. Bloomer presents match-up problems with his athletic ability and 6'5 frame. Garrett Martin is the starting tailback. He is a very good athlete and garnered district newcomer of the year in 2010 as a sophomore. The Bulldogs will substitute often as many of their top players go both ways. Wylie bases out of the 4-3 defense. The strength of this years bunch is the secondary. They have 3 returning starters. Conerback Kelvin James has the best cover ability with speed to burn. Middle linebacker West is a load at 6'4 220 and can really bring it. The Bulldogs are well coached, play hard, and tackle well. Wylie has several starters playing both. That may play factor late in the ball game especially on defense. The kicking game is pretty average for high school. #20 Kelvin James is their best return man.. This game could be a trap game for the Jackets. They are coming off an emotional victory and it is before the battle of 377 with Brownwood. Stephenville better be careful and not get looking behind or ahead or Wylie is more than capable of beating them. The Jackets put the state on notice with their win over Aledo. Now they must prove they are not a one game wonder and are worthy of their top 5 ranking. I believe they are. #7 Hewitt Midway Panthers (1-0) @ Round Rock McNeil Mavericks (1-0): Midway won convincingly over Round Rock 31-14. McNeil meanwhile beat a good 4A playoff team Bastrop 26-21. McNeil is picked near the bottom of 16-5A after coming off a 1-9 season. Midway rolls. Waco Lions (1-0) vs. Copperas Cove Bulldogs (0-1): Waco lit up the scoreboard last week in a 52-35 victory over Austin High. Cove lost a tough one last in Southlake, as the Dragons scored in the final minutes to beat the Cove 38-31. The 5A Bulldogs will be to much for the Lions. Killeen Kangaroos (1-0) vs. Killeen Shoemaker Grey Wolves (0-1): Shoemaker fell to San Angelo Central 21-7. The Roos will continue their advantage over intra city schools. Waco University Trojans (0-1) @ Hutto Hippos (1-0): Hutto beat Austin LBJ 43-26 while University was whooped by Forney 34-7. Hutto moves to 2-0. San Angelo Lakeview Chiefs (0-1) @. Fort Stockton Panthers (1-0): This will be one of Lakeview's few chances at a victory this year. Fort Stockton beat Big Spring 7-6 while the Chiefs were beat by 3A Andrews 14-3. I think Lakeview falls just short. Stephenville vs. Aledo 2011 from Cody Derrick on Vimeo. The early concerns of an Aledo hangover were quickly erased after a dominate first half by the Jackets. The defense which gave up 47 points last week was a major contributor against the Bulldogs. Wylie's only score in the first half came off a Stephenville offensive miscue. The Bulldogs were held to negative yards rushing and only 54 total yards in the first half. Wylie won the toss and elected to receive. They quickly went 3 and out and punted the ball to the Jackets. Stephenville marched down the field behind the passing of Tyler Jones and the running of Aiavion Edwards who capped the opening drive with a 3 yard run. The Jackets would force another Wylie punt, but on the ensuing possession Jones and Edwards fumbled the exchange. Wylie's Johnathan Bott was right there for the scoop and run from 29 yards out. That tied the score at 7 all. From that point on it was all Stephenville. Alex Sanchez would cap the scoring in the first quarter with his first TD reception of the year from Jones. The score was 14-7 Stephenville at the end of the 1st qtr. The 2nd qtr. featured several sacks by the Jacket defense and an 8 yard run by Edwards and a 32 yard TD pass from Jones to Gunter. Stephenville had a chance to add to its first half lead but a bad snap for a loss of 17 yards ended that threat. The 2nd half featured several miscues by both teams and long injury timeouts. One from Stephenville's Jonah Noah and another from a Wylie player. Noah was able to get up on his own and walk off the field with assistance after laying on the turf for several minutes. The Wylie player had to be immobilized and taken to the hospital by ambulance from an apparent neck injury. The severity and condition of the Wylie player is unknown at this time. We all pray for his health and recovery. The Jackets received the 2nd half kickoff and marched right down the field. Edwards finished the last 8 yards off with a TD reception from Jones making it 35-7. After Edwards' 3rd TD is when the injuries happened and things got sloppy after the long delay. Wylie would score it's only offensive points of the night with 8:05 left in the 4th qtr. Matt McLeod plunged in from a yard out to make the score 35-14 Stephenville. The Jackets would finish up the scoring when backup running back Cameron Burris scored his first varsity touchdown from 6 yards out, and that would be your final score 42-14. Stephenville hosts Brownwood next week in the battle of 377. The Jackets had every excuse to have a down game against Wylie. They were coming off an emotional victory over Aledo and they had their oldest rival Brownwood on the horizon. The men in Blue & Gold would have none of it as they took care of business last Friday in Abilene 42-14. The defense responded in a big way after giving up 47 points the previous week by limiting Wylie to just 130 total yards and 7 offensive points. The Battle of 377 is upon us football fans. This will be the 72nd meeting between the two powerhouses. Brownwood holds the over all advantage in the series at 25-44-2. Stephenville is 12-5 against the Lions since 1990 though. The Lions thumped the Jackets last year 49-16. It was a 5 point ball game with 4 minutes to go in the 3rd quarter before Brownwood erupted for 28 unanswered points. Stephenville will be looking to reclaim the bragging rights in what is sure to be another physical ball game. Get your cans ready Jacket fans because the weather is going to be nice and it is Stephenville vs. Brownwood. Last year Brownwood had a prolific passing attack with a strong ground game. The Lions are still going to spread you out but expect to see a much more ground oriented attack with just enough play action to keep you honest. The offensive line is solid led by returning starters Jose Avila at left tackle and James Crow at right guard. The only other returning starter on offense is running back Stehl Ratliff and he is a good one. His name fits his running style well. QB Mitch Stephens got some varsity experience at QB during his sophomore year when the Lions had injuries at the position. Stephens is like having another tailback in the back field. The Jackets will need to play disciplined football when Stephens and Ratliff work the inside outside zone read. When Stephens does go to the air look for Cooper Howey and Kevin Vaccaro. Both are more than capable of making big plays. The Lions base out of the 3-4 and if you remember from last year; they are not afraid to bring the heat from all areas. The Lions have only two returning starters on this side of the ball. Vaccaro at conerback and Ethan Horton at outside linebacker. The strength of this unit is definitely in their linebacking core. They all read and react very well. Vaccaro's brother plays in Austin for the Horns as a defensive back. He is play maker from his safety spot. The Lions kicking game is above average. The place kicker Matthew McCrane can kick the ball 5 yards deep in the endzone on kickoffs. Cooper Howey is the punter and he does a good job. Ratliff is their best return man. Unlike last week I have no doubts the Jackets will be up for this one. The Lions thumped Stephenville pretty good in 2010. Brownwood lost the vast majority off arguably their best team since their last state championship in 1981. Brownwood is a formidable opponent but not as stout as last year. If the Jackets bring it like they have the last two weeks they should come away with a convincing victory. #7 Hewitt Midway Panthers (2-0) vs. Belton Tigers (2-0): Both teams rolled last week as they topped the 50 point mark each. Midway against RR McNeil and Belton against Austin High. Midway still wins but they earn it this week against 5A Belton. Waco Lions (1-1) @ Killeen Ellison Eagles (0-2): Ellison got trounced last week 52-0 by Cedar Park. It won't get much easier this week against Waco. Killeen Kangaroos (2-0) @. Killeen Harker Heights Knights (1-1): The Roos will make it a clean sweep of the intra city schools this weekend. Waco University Trojans (1-1) vs. Killeen Shoemaker Grey Wolves (0-2): Trojans move to 2-1 with a hard fought victory over the struggling 5A Shoemaker. San Angelo Lakeview Chiefs (0-2) vs. Amarillo Caprock Longhorns (2-0): The Chiefs could be staring an 0'fer right in the face. Caprock has been impressive in their two wins over Levelland and Borger..
Stephenville @ Abilene Wylie 2011 from Cody Derrick on Vimeo. Note: You can click on the clover icon to go full screen. The Jackets performance last night can be summed up in one word, Dominant! If not for one penalty, a muffed punt, and one fumble it would be a near perfect game for Stephenville.The Jackets offense rolled up 590 yards on just 49 plays. That is 12 yards per play. The defense not to be out done held the Lions to just 222 yards with two interceptions including one for a pick 6. The Jackets 66-0 victory was the largest margin of victory over Brownwood in the 72 meetings between the two. The largest margin of victory prior to last night for the Jackets was 41 points when they beat Brownwood 50-9 in 1995. It was also the largest margin of victory ever by either side. Brownwood beat the Jackets 62-0 in 1987 for the previous largest margin of victory. The Lions received the opening kickoff and went 3 and out. The Jackets muffed the ensuing punt giving Brownwood the ball near Stephenville's 45. The Wardogs as they did all night would hold. Stephenville would score on 10 on their next 11 possessions. The first one coming on a 5 play 85 yard drive capped by a Tyler Jones 7 yard scamper. Aiavion Edwards would finish out the scoring in the first quarter with the first of 5 touchdowns, this one from 28 yards out. Brownwood had a good drive to open the 2nd quarter. They started at their own 24 and drove all the way down to the Stephenville 6. The Wardogs bowed their neck and forced a FG try which the Jackets blocked. The Jackets would score 21 more points in the 1st half. The first was an 11 yard TD pass from Jones to Gunter, then an Edwards 5 yard run and Edwards' 3rd TD of the night this one from 2 yards out. That made the score 35-0 Stephenville at the half. Any concerns of a loss of focus by the Jackets after halftime were quickly erased. Brownwood kicked off to start the 2nd half. The ball went out of the back of the endzone for a touchback. The Jackets started at their 20. They quickly went 80 yards in 5 plays as Edwards got his 4th TD of the night, this one from 36 yards out. The Lions would have their best drive of the night as they went from their 23 yard line all the way down to Stepehnville's 5 yard line. Brownwood had 1st and goal from the 5 and went backwards from there. They settled for a 34 yard FG attempt that went wide left. Edwards would get his 5th TD of the night on the ensuing drive. This time he darted up the middle from 37 yards out. Braden Coverdale would extend the Jackets lead to 56-0 with a 12 yard interception return for a TD. Stephenville's finally score of the 3rd quarter came after their 2nd INT of the night. Blake Barnes remained perfect on the year with a 29 yard field goal. Stephenville held the ball for nearly the entire 4th quarter on their final drive of the night. They had a 13 play drive that chewed 10:34 off the clock. Cameron Burris carried the ball on all 13 plays finishing it off with a 5 yard TD run with 2:06 left. Stephenville makes the long road trip to Lewisville next week to take on the Hebron Hawks. Hebron beat the Jackets last year 17-14. Stephenville totally dismantled their arch rival Brownwood last Friday. The Lions still hold a commanding lead in the series at 44-26-2 but they have never beat the Jackets as bad as Stephenville beat them on Friday night. The 66-0 victory the Jackets produced out did the 62-0 victory Brownwood had over Stephenville in 1987. I am sure this game will add even more fuel to fire the next time these two meet, but until then the Jackets have the bragging rights. Stephenville goes from 3A competition to 5A this week as they make the long trek to Lewisville to take on the Hebron Hawks. Hebron will challenge the Jackets with the best defense they have seen thus far. TheOld Coach.com has the Hawks ranked # 16 of DFW 5A teams. Dave Campbell's picked Hebron to finish 4th in district 8-5A. They beat the Jackets next opponent Mesquite Horn 21-20 last week. I am looking forward to my first trip to Hawk Stadium, what the Hawk fans affectionately call "The Woodshed". Hebron will run out of the spread offense and through two games they have been about a 60/40 run/pass team. Running back Dezmond Wortham is a dynamic back that started last year and has varsity playing time since his freshman year. Receiver #3 Kiante Griffin suited out but did not play last week. Griffin is one of the top receivers in the state. He is listed as a Dave Campbell's 3rd team Super Teamer at WR. Gone from last year is QB Kyle Aubuchon, he was a multi year starter. Joseph Farley takes over the reins and has flashed his dual threat ability. The Hawks play out of the 3-4 defense. They have good athletes at linebacker led by returning starter Brett Weir. The head liner of the bunch is DE Deatrich Wise. Wise is a 3rd team Super Teamer in Dave Campbell's. Hebron has an all new secondary and they struggled some in their loss to pass oriented Colleyville Heritage. Heritage rolled up 325 passing yards on them. Hebron has a pretty average high school kicking game with game breakers returning the ball. The Jackets will need to be very good in their coverage teams this week..
Hebron will have the best defense the Jackets have seen thus far. The Hawks are a top 20 DFW area team that should make the playoffs in 5A. Hebron is very tough at home. Stephenville is executing at a high level right and playing with a ton of confidence. That will carry over into a tough game with the Hawks. Hewitt Midway Panthers (2-1) @ Everman Bulldogs (1-1): Midway was upset last week by Belton. Everman was off last week but had a two point victory over FW Southwest in their last outing. The Bulldogs were thumped pretty good in their first game against Highland Park 48-28. Midway gets back on track this week. Waco Lions (2-1) @ Abilene Wylie Bulldogs (2-1): Wylie got back to their winning ways last week beating Graham 21-7. Waco fought one out with Killeen Ellison 21-10. Waco's speed gives them the edge in this match up. Killeen Kangaroos (2-1) vs. Round Rock McNeil Mavericks (1-2): Killeen lost a game I thought should of won last week against cross town Harker Heights. McNeil struggled last year but is playing much better ball in 2011. I think this will be a tight ball game with the Roos coming out on top. Waco University Trojans (1-2) vs. Cleburne Yellowjackets (1-1): This is a battle of teams that struggled last year. Both are looking to turn the corner. I give a slight edge to University at home. San Angelo Lakeview Chiefs (0-3) vs. Midland Greenwood Rangers (1-2): This maybe the last chance for Lakeview to pick up a "W" this year.